MONTREAL, March 04, 2019 (GLOBE NEWSWIRE) -- Imperial Mining Group Ltd. ("Imperial") (TSX VENTURE: IPG) is pleased to announce that it has mobilized crews to commence diamond drilling activities on its Crater Lake scandium project, northeastern Québec (Figure 1). 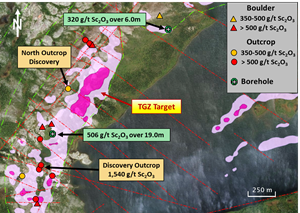 The program calls for up to 2,500 m of diamond drilling to be completed on the TG Zone (TGZ) target (Figure 2). The diamond drill program will commence in early March and is expected to be completed by the end of April. Data from this definition drilling will be used for a 43-101 Inferred Resource calculation, which is expected to be delivered by the end of May or early June. The ultimate objective of this exploration work is to deliver a Preliminary Economic Assessment on the scandium resource towards the end of the year or early 2020. The highest scandium grades obtained from the property were returned from a highly-magnetic pyroxenite horizon related to a 6-km diameter alkali intrusive Complex. Previous exploration programs over the pyroxenite target returned very high scandium grades in drilling of up to 167.8m grading 260 g/t Sc including 62.8 m grading 304 g/t Sc2O3 and including 27.6 m grading 351 g/t Sc2O3. In addition, previous drilling at the southern margin of the TGZ target returned a high-grade scandium intersection grading 506 g/t Sc2O3 over 19.0m. 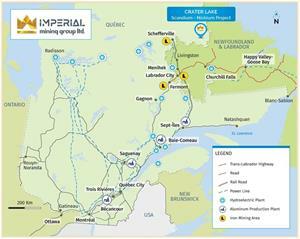 Imperial’s summer prospecting and grab sampling program over the TGZ target area returned between 404 g/t and 1,540 g/t Sc2O3 in outcrop (see Press Release: October 30, 2018). These grades compare well with those reported from other scandium resources presently being explored in Australia and the United States. 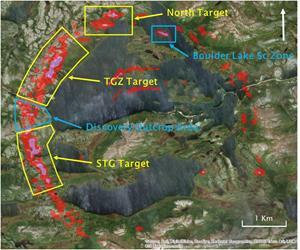 The magnetic anomaly related to this target measures 600 m in strike length by 200 m wide and represents a very attractive scandium target for drilling (Figure 3). The drilling will be conducted along 100 m spaced sections with three (3) boreholes to be drilled per section (Figure 3) for a total of 15 holes. Forage Avataa-Rouillier of Kuujjuaq, Québec, is the contractor for the drill program. Samples collected from drilling will be submitted to Actlabs of Ancaster, Ontario for geochemical analysis upon completion of the program. A quality control program will be followed and certified standard and blank materials will be inserted at regular intervals throughout the sequence of samples. As well, duplicate samples will be also inserted. Scandium acts as a grain-refiner and hardener of aluminum alloys. Aluminum-scandium alloys combine high strength, ductility, weldability, improved corrosion resistance and a lower density. The combination of all these properties makes aluminum-scandium alloys well-suited for the aerospace, automotive and defense industries. The broader adoption of scandium in the aluminum alloys sector has been constrained by the limited availability of scandium in western commercial markets from primary suppliers, China and Russia. The lack of an assured source of supply to provide material for additional applications has also limited market expansion. This has resulted in much higher prices for Sc compared to competing alloy materials, such as titanium, and has limited its broader industry adoption. Imperial’s outreach activities in Stuttgart during the week of February 19th to 21st with German auto industry OEMs was very positive as the industry truly embraced the potential of a long-term, sustainable source of scandium as presented by our Crater Lake project. Efforts are now underway to solidify application R&D partnerships for programs that will address the auto industry’s requirements for lightweighting solutions for future EV and Internal Combustion Engine (ICE) platforms. Chassis Development – The general thinking is, aside from the mechanical qualities offered by Sc-Al, there is scope to change the design philosophy and in turn reduce the amount of Aluminium used per automobile. With EV, given the weight of the battery packs, this will not, we assume effect the balance/handling of the Auto, but certainly a consideration for the ICE/Hybrid Platform. Lightening of the chassis would extend EV range and improve fuel efficiency of combustion engine vehicles. EV Battery Tray – The strength and weight saving characteristics of Sc naturally lend themselves to Battery Trays, but we believe Sc-Al offers an alternative solution regarding corrosion resistance and high ballistic protection afforded by the alloy. NASA previously completed work with Sc-Al seeking a material that would remain inert in contact of rocket fuel plus had ballistic resistance qualities against micrometeorite impacts in space. Our belief is these characteristics would play very well for Battery trays and offer a potential safety solution around the battery packs themselves while reducing weight. Hydrogen Fuel Tanks – NASA has also found that Sc-Al for Hydrogen Fuel tank applications is an interesting area within the Automobile value chain. Hydrogen fuel cells will likely be the longer-term clean mobility solution as opposed to EV. Hydrogen fuel tanks are complex items and for the moment are expensive with market studies stating that a tank can cost up to $30,000; from the research we have conducted Tank development is the one of the major inhibitors to fuel celled cars being more widely adopted. Crash Structures – At the Conference we heard about Crash Structures in cars as being an area of interest and based on the discussions of last week, we agree there are several characteristics in Sc-Al which would lend itself well to Crash Structure applications. Truck & Auto Wheels – There is a call from fleet managers of trucking groups to strengthen and lighten truck wheels to reduce fuel costs through weight savings and to improve road safety. The same consideration applies to automobiles. The technical content in this press release was prepared, reviewed and certified by Pierre Guay, P. Geo., Imperial's Vice-President, Exploration, a Geologist and Qualified Person as defined by NI43-101.